Variety quickly gave way to a specialisation in film performances, with occasional performances by big bands. In June 1939, the cinema was one of the three London sites chosen to present a live relay of The Epsom Derby from the pre-war BBC experimental transmissions, utilising Baird equipment to project onto a screen 15 feet by 12 (4.6 by 3.7 m) in sepia. From September 1940 to May 1941, the theatre was closed due to World War II, but no serious damage was sustained and it reopened quickly. Plans were made for demolition in the 1950s, but it was saved and presented a mixture of ballet, live shows and films. The last films were shown in November 1975, a double bill of Peter Cushing in Legend of the Werewolf (1975) and Adrienne Corri in Vampire Circus (1972), though the theatre remained open until 1976, after which it closed for five years. It was a rock concert venue from 1976 until around 1980 with acts such as ELO, Peter Gabriel,Janice Ian and many others playing there. Led Zeppelin rehearsed there, on May Day, 1980. 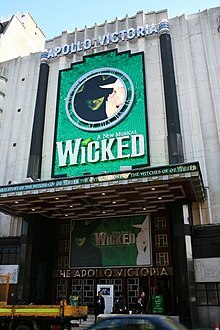 It reopened in 1981 as the Apollo Victoria Theatre with a Shirley Bassey concert.